Despite working with companies of all sizes for more than a decade, we driven by ideas and advancements to help grow businesses. If any of these stories sound interesting, please contact us. We can help navigate a way forward. Unless you intend to market your products or services to a particular political or politically-minded segment, it's often best not to raise the topic of local, state or national politics with your current or potential customers. Like many prominent business owners have experienced, weighing in creates an unnecessary risk of a backlash, loss of brand equity and the potential waning of business. Recent examples include comments from senior management of Twitter, Coca-Cola, Amazon, Google and others—all of which gained tremendous press coverage but also required additional communication not focused upon the company's core business, strategy or customers. While everyone is certainly free to express their opinions, we encourage it be done under a personal account—not the Facebook, Twitter, Instagram or web pages of your business. Also, be sure your fleet vehicles are free of bumper stickers. And the data doesn't lie. 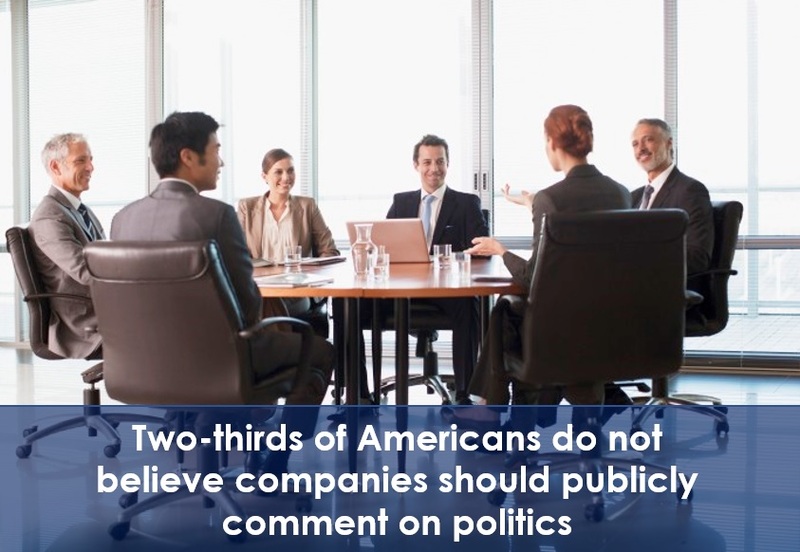 Today, 67% of all American consumers believe it's best to leave politics out of the business discussion. We also encourage that each firm remind every team member to focus upon serving clients and to politely withhold their political views unless asked. There is no harm in responding to an inquiry, but ensure everyone is courteous and respectful of others—regardless of their positions. If you have questions how politics can impact your brand, please contact us. With continual hacking activity and ongoing monitoring by third-parties, it's time to more fully protect your site visitors by always using secure web methods or HTTPS (Hyper Text Transfer Protocol Secure). HTTPS encrypts everything between your visitor's web browser and your website—so anyone who might be eavesdropping on the electronic dialog cannot discern what’s being communicated. Historically due to server load and the cost of security certificates necessary to enable encrypted dialogs, HTTPS has only been used when communicating sensitive financial or personal information—such as credit card information, user names and passwords. Approximately two years ago, Google began elevating the organic search rankings of sites that always employed HTTPS. But most recently, Chrome and Firefox started generating increasingly visible user warnings for submissions that are not protected by HTTPS. To prevent unnecessary customer concern, it's time to turn on HTTPS for all of your web pages. You'll provide greater security to your visitors while also outranking your competition that continues to operate in HTTP. Contact us if you would like to discuss this topic or would like assistance enabling HTTPS on your website. You created a snappy new website with original information, included the perfect images and optimized the content for the search engines. But you're still not receiving many visitors or inbound leads. What’s going on? 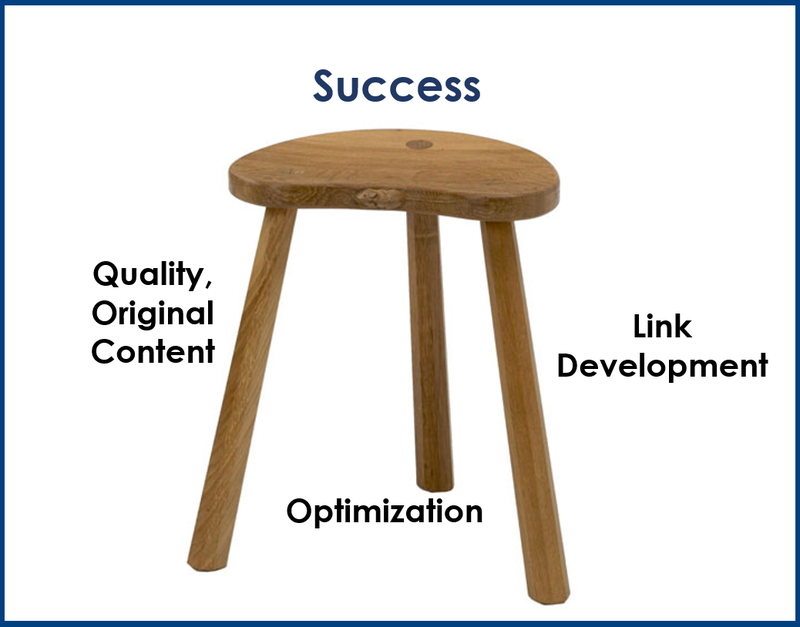 The odds are you forgot the third leg of the stool—link development. Links from reputable sites are vital as they provide a context for your content. Just as your friends help define you, links to your site help users and search engines understand the products and services you offer—and when you should be included in their recommendation set. It's tempting to turn to an automated submission company to quickly tackle this essential challenge. But we strongly advise against it as most will immediately remove all of your links should you decide not to renew your link-building subscription—leaving you high, dry and out of leads. For most businesses, 50 quality links is the magic number. While it takes time, selecting the right directories is essential and tackling two per day is the recipe for success. In a month, you'll be done—and your links cannot be taken away. When adding your company to a site or directory, it's imperative that you use consistent information. We suggest developing a compelling one paragraph description of your business—and a shorter one sentence version. We also suggest creating two versions of your logo—a square 250 pixel version and larger horizontal treatment. You should also document, in advance, your hours of operation, telephone number, fax number, mailing address, email address for incoming inquiries and the types of payment you accept. Importantly, you should also develop a summary of your offerings complete with headlines, detailed descriptions and supporting images. We are not afraid of heavy lifting and we are willing to do the manual work for you. It will deliver lasting results and you'll be glad you can more easily be found by your clients, search engines and potential customers. Let the phones ring. For decades, television has been the "go to" media enabling companies to build awareness, develop brands and drive sales. Unfortunately, the cost and complexity associated with creating television ads prevented most small and mid-sizes businesses from harnessing a truly engaging medium that consumers love. But in the 1990s, the Internet showed promising signs that a new interactive medium might level the playing fields—empowering businesses of all sizes to reach highly targeted audiences in a meaningful way. 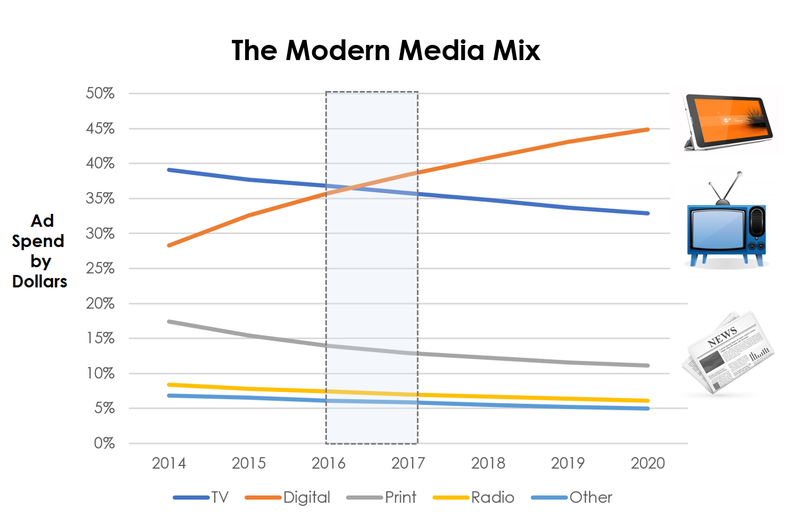 In 2017, it is expected that digital advertising (including mobile) will garner more ad dollars than television as print (magazines and newspapers), radio and other forms of advertising continue their annual decline. Despite the growing use of digital advertising, television remains the "king of engagement" providing exceptional abilities to emotionally connect with an audience. Digital advertising provides outstanding abilities to introduce product, educate buyers, drive sales and build brands. Print advertising offers qualified reach and proven branding abilities. If your company is relying upon print or television advertising, please contact us. We can help you develop a cost-effective advertising campaign that harnesses the strength of each medium. Unless explicitly granted away under a contract or employment agreement within the United States, a creator owns the rights to their work for their lifetime—plus 70 years (the rights transfer to the creator's heirs). Barring fair use, copyrights are important as they enable those who create to have control over their work and how their creations are used. Those who register their works with the United States Copyright Office receive additional benefits including legal fees and triple damages from infringers. Regardless, all Copyright owners have the obligation to police their own work, notifying unauthorized users of their violation. While Copyrights (protection for original works of authorship) are intellectual property, they should not be confused with Trademarks (identify the source of a product/service) or Patents (prevent others from making, using or selling an invention). We have helped our clients secure many Copyrights and Trademarks, so please contact us if you have questions. Times and technology are certainly changing. But if you think your business doesn't need to be easily accessible via mobile devices, well think again. 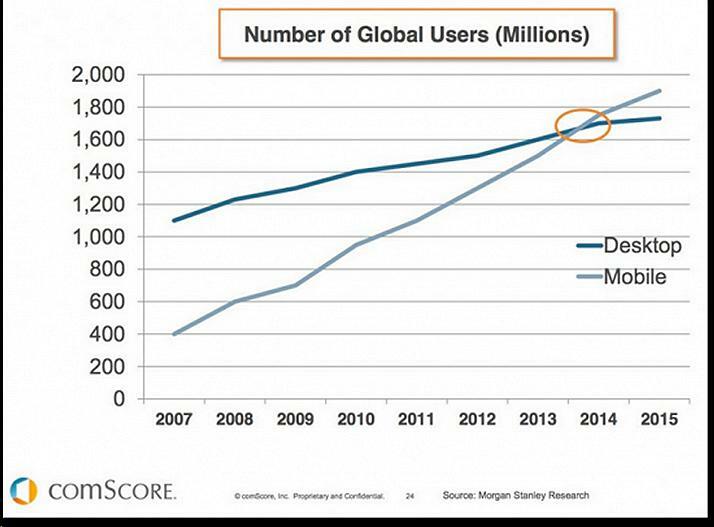 comScore reports that 2015 will be the first significant year whereby more people will view content using mobile devices than desktops. 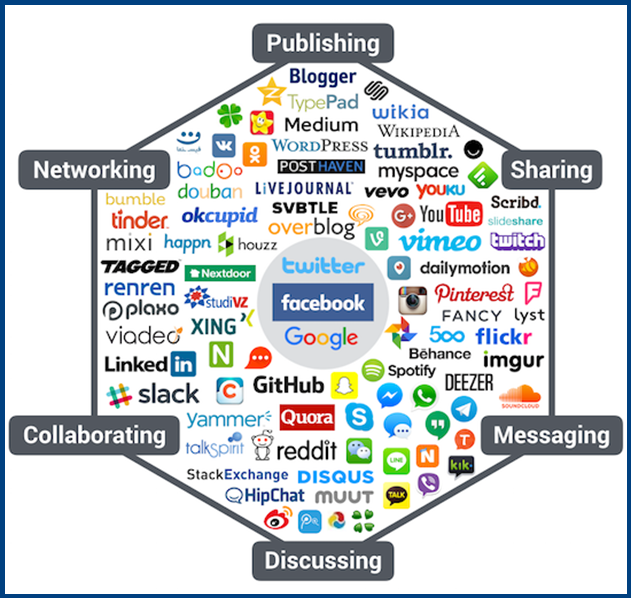 Importantly, all of your content needs to be available to both desktop and mobile users. To save time and minimize content duplication efforts, your mobile solution needs to be integrated into your overall marketing, messaging, and branding approach. This means your mobile site cannot be a one-time replication and optimization of your existing "desktop" content. If your site does not render your information in the appropriate format based upon the type of accessing device, please contact us. We can help you reach the growing mobile audience while saving you time, money, frustration, and lost business opportunities.